Are you planning to sign up on Christian Dating For Free? Is that the reason why you’re at this Christian Dating For Free review? Then go ahead and read so you can get to know more about the site. Some people think that joining online dating sites are not ideal because they might be compromising their values. This is explicitly for people who are practicing their religions they way it should be exercised. One of the dating sites that cater to religion is Christian Dating For Free. As the name says, they provide to men and women who are Christians and are looking for a match who have the same values as they have. So before you get all excited about this Christian dating site, it would be best to get to know it by reading this Christian Dating For Free review that’s provided just for you below. Christian Dating For Free is owned and is a subsidiary of E Dating For Free Inc. It is one of the most dynamic service providers of online Christian dating. They have been using nothing but the most advanced software applications and the latest in technology. This is to ensure that their members will enjoy the quality of match that Christian Dating For Free will provide. One of the best things about this online dating site is that they secure all of the personal information of their member. So you don’t have to worry about that. Christian Dating For Free’s goal is to provide nothing but the best experience to every member that they have. Also, they aim for each Christian Singles to get to know each other and make their lives happier. The safety and privacy of Christian Dating For Free are one of their top priorities. As mentioned above, your information is guarded heavily, and they always take extra precaution to ensure that the users are protected against inappropriate material and profanity. All members are advised to report any indecency that they may encounter. Also, the contents that are objectionable will be responded and reviewed within 24 hours. One of the best things about Christian Dating For Free is that they don’t have any membership fee. They are not like other online dating sites that are offering advanced features for a price. Yes, there may be text ads, inbox ads, and banner ads, which can be annoying, but that is just what you will get for enjoying a dating site for free. Of course, if you want to get rid of these annoying ads, then you can pay for it. As you all know, Christian Dating For Free is a faith-based website, wherein Christianity plays a significant role in your overall experience here. This also means that your profile will have your denomination and as well as non-denominational features. In fact, if you visit the chatroom, you will notice that religion is presented densely. The reason behind this is because you will find message boards with a mix of secular topics under Christianity. When it comes to the live chatrooms, there will be rooms where there are Christians in their 30s; there are also Bible study rooms, and of course general Christian Chat. Christian Dating For Free has an Account Setting feature, which will let you filter the member that you want to contact you. This is also where you can manage all your email notifications. The customization will allow you to control the members that can contact you. For instance, you can click on the box Drinking, which will block every member who is drinking from contacting you. Also, if you only want men to contact you then may also do so, and you can even choose the age bracket. In this feature, you can also decide if you want to get notified once someone sent you a message. You will also be notified if you have been added to a member’s favorite list. Now, once you have clicked the My Matches feature, you will see some of the profiles that the site thinks that is good for you. This will usually be based on the location and the selection that you chose in your Account Setting. For instance, if you preferred members who are aged 25 to 40, then only the members who are under that age will be shown on My Matches feature. Favorites are where you can see the profiles that you often visit when you’re logged in on Christian Dating For Free. You can access this by going to the profile and looking at the top right of the page. Also, you can add the members as your favorites; they will also know that you have favorited you. 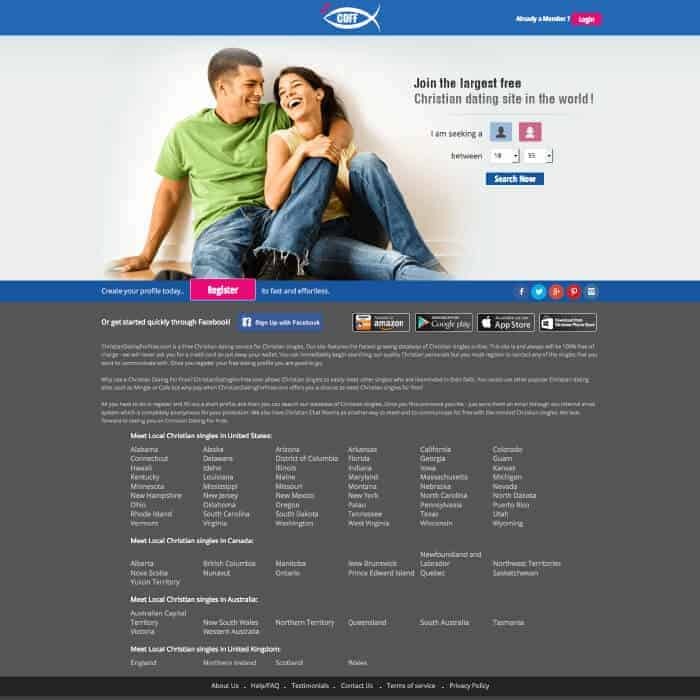 Christian Dating For Free has a paid subscription where all of the sponsored promotions are removed. It only costs $4.95 per month, which is more affordable compared to other dating sites today. Both members, who are under a free or paid members can also donate via Paypal to help support the operation of the site if they like their dating site experience. When it comes to communication on Christian Dating For Free, you can use their mail messages, chat, and even wink messages. You can also keep the members that you like chatting within the favorite list. Also, you will also be seeing the people who have viewed your profile so you can say hi to them if you feel like it. Now, when it comes to searching, you can use the filters by location, looking for, age, and as well as gender. They also have an advanced search wherein you can use deeper filters, including religious affiliation, appearance, lifestyle habits, and as well as marital status. The desktop site of Christian Dating For Free has no frills at all. It is tech-savvy, which is entirely unexpected. In fact, the website dating site has its own Pinterest, Instagram, Twitter, and Facebook. Christian Dating For Free has an app, which is a good thing for people who are always on the go. Yes, there are still ads, but the app has all of the functionality that it has. App members have the ability to read messages, send messages, conduct searches, and as well as view matches. Everything that is available on the desktop version is also possible in the mobile app. Another good thing about the app is that members have the ability to change the account settings and their profiles. You can easily download the app from Amazon, Google Play, and iTunes. There are a lot of people who are out there to victimize the kindness and generosity of other people. Christian Dating For Free always try and make sure that they keep their members safe. But this doesn’t mean that their members are entirely safe, which is why they also give tips on how everyone can be safe. For instance, if someone is asking you to send money or buy something from them, then it would be best to ignore them. You can also report them by contacting Christian Dating For Free. All you have to do is go to the Contact Us page and send the username and proof of anything that states that they are a scammer or something like that. Susan and I met on CDFF. After I had a bad experience on another Christian dating website where I was required to pay in order to communicate with others, it was a breath of fresh air to know that CDFF was truly free. I wanted to find local women but thought okay, I would see who is online. That was when I came across Susan’s profile. Although she was 2000 miles away, we were able to communicate with each other openly and honestly. These are all of the information that you need to know on Christian Dating For Free. This Christian Dating For Free review, you probably know by now on what you should expect once you hit that sign up button.